Obtain 20 CPE hours with this special discounted bundle. It includes enrollment into the full versions of Volume 1 and Volume 2. CPE is earned incrementally upon the completion of each volume (9 hrs for V1 and 11 hrs for V2). The certificate of completion date is the date you complete the final exam for each volume. The enrollment period is one year. If you are sincere about improving your Excel skills, you have come to the right place. 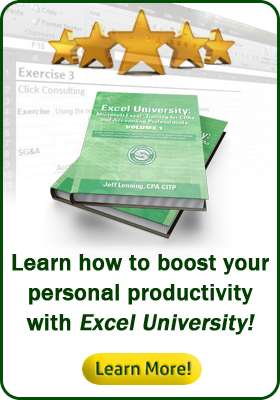 In this comprehensive Excel training package, you'll learn skills that are sure to help you get your work done faster.